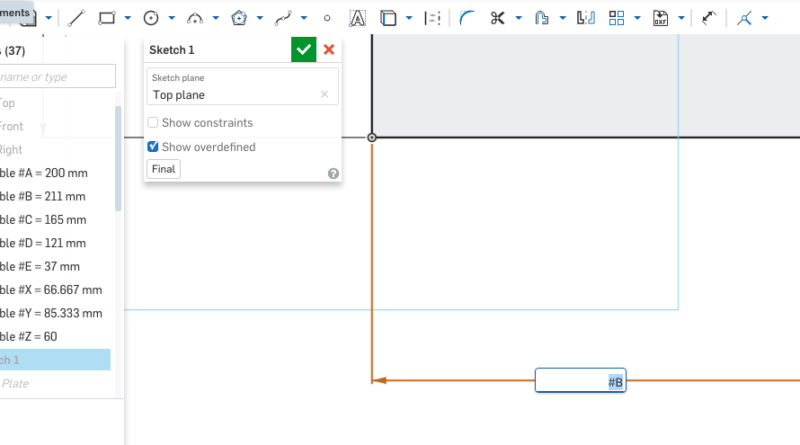 One of the drawbacks of Onshape is still the limitations in features. An obvious omission, compared to things like Solidworks, is the ability to use design tables to drive dimensions. Doing so make it easy to update a number of features or dimensions simply by editing a single table. The workaround is to use a series of variables. This is what I did for the CSWP in Onshape model. It is a bit tedious to go through and update 7 individual variables, accepting each one and waiting for it to update, but it is still far simpler than editing the in sketch dimensions. Here is a gif of how to change the variable value. As a best practice I keep all the variables at the beginning of the feature tree, which makes them easy to quickly review and organize. ← Pricing Of Popular CAD Programs: Solidworks Vs. Onshape Vs. Inventor vs. SolidEdge vs. Catia vs. Sketchup vs. Etc!